Bull Terriers are Not Pit Bulls! Is the Alaskan Malamute the Right Breed for You? Newfoundland Dog Facts – The Versatility of the Gentle Giants will Amaze You! How do I Become an Author? How do I Find a Publisher? Getting a Puppy? Breeder or Rescue? Alopecia areata means “an area of hair loss.” The condition is presumed to be due to an immune-mediated attack on growing hair follicles. This is most often seen as a patch of hair loss on smooth skin that doesn’t seem to be inflamed. In people, there is at least circumstantial evidence that the disorder is autoimmune in nature, and this theory has been extended to dogs (rightly or wrongly). Actually, alopecia areata is not a dangerous disorder at all and it really represents a patch of baldness with no health risk. The diagnosis can be confirmed by biopsy if the samples are sent to a pathologist with expertise in disorders of the skin. The biopsies show a collection of white blood cells (lymphocytes) preying on growing hair follicles. Once the hair follicle goes into a resting stage, any inflammation that might have occurred subsides. This leaves a patch of smooth skin without hair. Biopsies are important, because other diseases (e.g., ringworm, bacteria, rabies vaccination sites) may look quite similar yet are treated quite differently. Interestingly enough, after the inflammation has subsided, the lack of growing hair follicles is very similar to conditions produced by hormonal disorders such as hypothyroidism, and this mistaken diagnosis may be made if the pathologist is not provided with accurate clinical information. To learn about other Immune-mediated skin diseases, read Lowell Ackerman’s informative book, Guide to Skin and Haircoat Problems in Dogs . 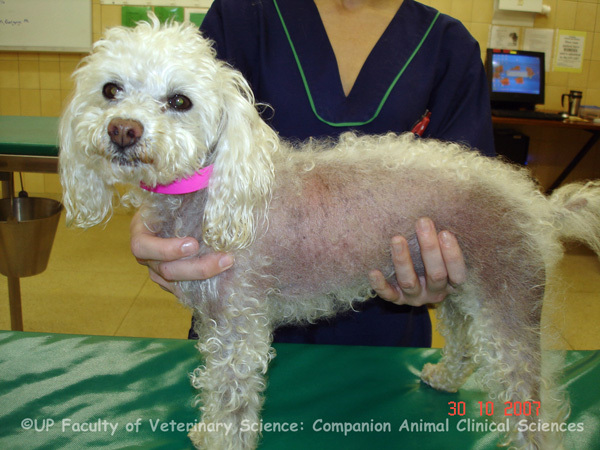 This entry was posted in dog health and tagged alopecia areata, alopecia areata in dogs, dog care, hair loss in dogs, skin disorder in dogs. Bookmark the permalink. Newfoundland Dog Facts - The Versatility of the Gentle Giants will Amaze You! Sign up for our dog newsletter. If you also love horses, follow our horse blog!